Allure Sensuelle is the flanker to Chanel’s Allure fragrance. My love for Chanel Allure has faded a bit since I wrote about it last. While I still wear it, the fragrance doesn’t have the same amount of “punch” it once did. In Bottle: Dusty and woodsy with a floral note and a bit of vanilla. Applied: Dusty fruits and vanilla with a hint of wood upon application with a tart and very quick sting of citrus. The fruity midstage is slow to develop but it eventually rolls in making the fragrance smell like creamy fruit slathered onto a plank of wood from the woody notes in the base wafting up. I’m not sure that I like that combination. It doesn’t read to my nose as something I particularly like or want to keep smelling. The strangeness of the mix is repelling me as opposed to drawing me in, but I will admit the fragrance’s warm creamy oriental side can keep me around. I’m not too fond of Allure Sensuelle though she smells just lovely and when I compare it to the original Allure, I think I gain a bit of an appreciation for it. 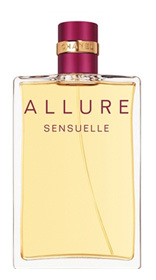 Extra: Allure Sensuelle was introduced in 2006. If you want to get some of this stuff, Chanel sells it in body lotion, EDP, and Parfum iterations. Design: Allure Sensuelle looks largely like Allure except with a richer, deeper color scheme. Otherwise the parfum version comes in a very beautiful flacon that I wouldn’t mind displaying as it looks like a classic Chanel bottle. Notes: Bergamot, mandarin, pink pepper, jasmine, rose, iris, fruit, vetiver, French vanilla, amber, patchouli, frankincense. Sorry, Allure Sensuelle, you don’t really work for me. Though it is a nicely composed fragrance with a rather interesting approach to woodsy orientals with its fruity and creamy introduction. Reviewed in This Post: Allure Sensuelle, 2007, Eau de Parfum. This entry was posted in chanel, oriental, Reviews By House, woodsy and tagged amber, bergamot, frankincense, French vanilla, fruit, iris, jasmine, mandarin, patchouli, pink pepper, rose, vetiver. Bookmark the permalink.